According to Olivia, she used Apple’s charger and that the iPhone 7 had been working properly the week prior. This week she had problems with the phone not switching on and had it checked at an Apple store only to find that there was no issue with it. She had the phone charging next to her the following morning and her boyfriend placed it on the dresser. 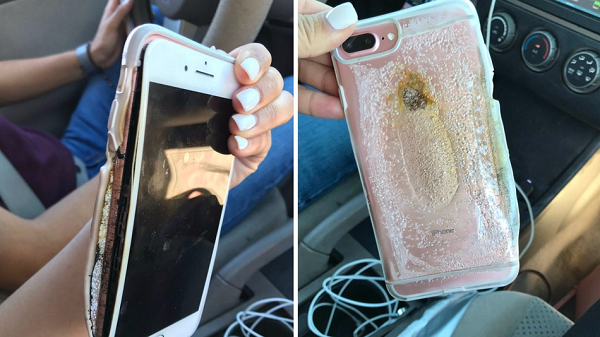 Olivias said that from the restroom he saw the iPhone 7 “steaming and [heard] a squealing noise.” From there the phone caught fire and her boyfriend threw the phone into the restroom where it “blew up and more smoke started coming out of the phone,” according to Olivas. What’s left the phone has been handed over to Apple for them to run more tests and find out what happened exactly and she received a replacement handset. Since this was an isolated incident, there’s been no warning about iPhone safety.